Checking game cameras is like opening presents on Christmas morning for most hunters. The anticipation you feel as you approach that blinking light on the cover is enough to make you feel downright giddy. You read the screen and discover you have 231 new pictures. That’s like having 231 Christmas presents under the tree! Now, just like some Christmas presents are going to be the usual socks and underwear, we know that some of these images are going to be duds. Depending on how sensitive the motion detector is on your camera, you may have a few dozen pictures of weeds swaying and songbirds landing on branches. But, if you did your scouting correctly and placed the camera in a good spot, you’ll have some great pictures of deer kicking up snow to get to the turnips in your food plot, or a fawn nudging his mom, or maybe even a couple of bucks duking it out in the field. No matter what the deer are doing in your trail camera photos, you want to keep track of each deer in the photos if you can. The purpose behind the thrill of capturing deer herd activity is to maintain an accurate tally of the deer on the property and to keep a record of the movement of those deer. Hunters have multiple ways of keeping track of deer they find in game camera pictures, but most hunters use naming systems whether it be for convenience or for pleasure. I love when my boyfriend and I discover new bucks on our property both because it means there’s another deer out there for us to harvest and because we get to name it. When we first started using trail cameras, the naming process was simple. A spike was named Spike; a nubbin’ was named Nubs or Button Buck. A buck with a lot of kickers was named Trash; a scarred buck was called Tuff. But, as we put out more cameras and found more deer, the names didn’t come to mind quite so easily. We soon realized that there was not just one spike on the property, but two. There was almost no way to tell the two apart. 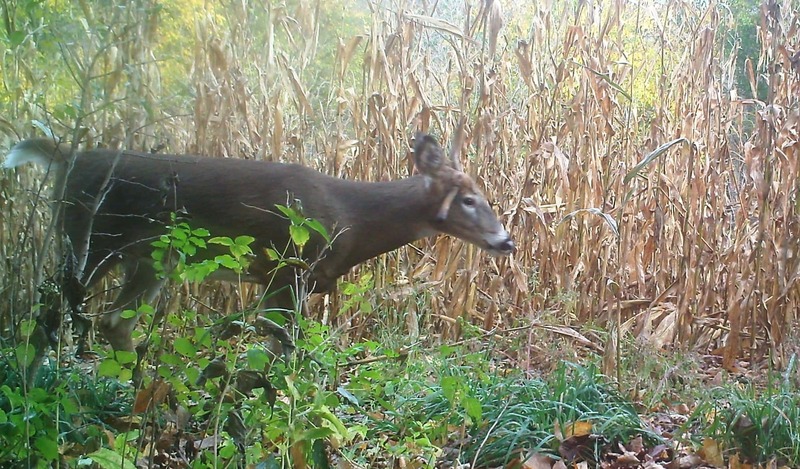 And, of course, there were multiple button bucks and fighters out there. We were going to have to be more creative. The naming of the bucks in our herd has become a sort of memory game in that we have to challenge ourselves to think of a name that will spark our memories enough to bring the right buck to mind. It has to be memorable, unique, and meaningful. So, years later, we now have Star, Rolly Polly, Unibrow, Blades, Unicorn, Beach Bod, Basket Rack, Trophy, Popeye, Skyscraper, and many more. This new naming process is not only more fun that the old process, but it focuses on the distinctive characters of each buck. It’s easy to talk about the deer on our property now because when we say Unibrow, we know exactly which buck we are referring to. Unibrow, as you may have guessed, has one brow tine. However, he is not the only buck on the property with one brow tine. For example, Beach Bod also only has one brow tine, but what makes him unique is his muscular body. Just the other night, my boyfriend and I had a bit of a naming conundrum with a newly found buck on our property. 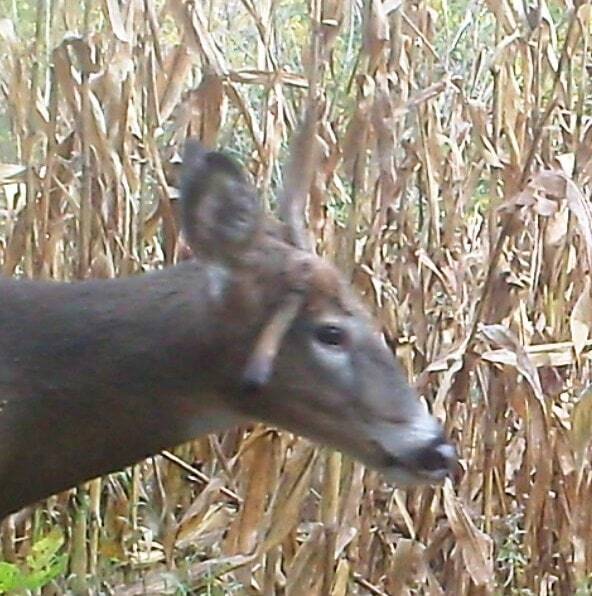 If you look closely at the picture, you can see that this buck has another deer’s antler sticking out of his face. You would think a unique feature like this would be easy to name, but all the names we came up with were already being used: Jacked, Jackknife, Blade, Spear, Scar, Poke, etc. After naming and renaming this buck over and over, I finally resorted to an online thesaurus to look up synonyms for “knife.” And just like that, we had a name for our new buck: Shank. Whether you resort to a thesaurus like I did or you come up with something on your own, I assure you that giving your bucks unique names can be useful. If nothing else, it helps you organize your game camera pictures on your computer. Instead of having files named Spike_1, Spike_2, Spike_3, you can have three unique file names for each different spike. And, if you are a hunter who wants to get your kids involved in the outdoors and get them excited about hunting, have your kids help you brainstorm for names. Let the whole family get involved and then choose the name by picking it out of a hat or by voting for the best name. It’s a sure way to involve your kids of every age and keep them involved as you track “their” deer throughout the season. Naming bucks also helps you keep your herd details private in some cases. This isn’t a concern for everyone, but I know we have had problems with it on occasion. With a unique naming system, it makes it easier to avoid accidentally letting everyone know the size of the bucks on your property. For example, if I want to talk about one of our 10-pointers making a scrape, instead of saying, “We have a 10-pointer making a scrape on camera,” I can say, “We have a buck we call Beach Bod making a scrape on camera.” This way, no one has to know if Beach Bod is a spike or a record buck. And, of course, naming your herd makes the harvest that much sweeter. Every deer has a story, but giving a buck a distinctive name adds an extra element to that story. It gives the buck a personality. You know that deer on a specific level. He’s not just another cull buck. He’s Star, the one you have been tracking on camera for months, the one who always licks the camera lens and has a mole on his back leg, the one you wanted to get out of the herd. So whether you name your bucks to get your kids involved or to sweeten the harvest, it is a practice worth implementing. And, if you already name your bucks, I challenge you to come up with names for each buck to give each one a specific place in your mind when you imagine the deer in your herd. Let us know some of the buck names you have come up with in the past, and tell us why you chose that name. Or, if you have a buck that is in need of a unique name, post or send a photo and let the Big Game Logic community help you out!